If you’re on Facebook, please click the like button above! Thank you! It’s the end of August, still one of the most sweltering times of year where I live. Summer is giving it’s last hoorah and showing off what it can do here in the South while most of us natives are flipping wistfully through fall clothing catalogs at pictures of folks walking atop hills in chilly breezes while snuggling up in their cozy sweaters. I’m so ready for fall. I’m ready to wear the sweaters that are never quite appropriate where I live (it never really gets wool-sweater cold here but the models in that magazine make them look so comfy we can’t refuse). I’m ready to bake apples and rake up leaf piles and look for pumpkins. I’m ready to pull my jeans back out and lace up ye olde hiking boots on a crisp Saturday morning to head up to Monte Sano Mountain with the kids. I’m ready to drink my coffee without it making me sweat :). (Apologies to my dear mother. You are right, Mama, ladies do not sweat, we glisten. But I wanted to make sure folks understood my point here so I had to be blunt). …and I’m really ready for fall food. We have a completely different menu in the fall than we do in the summertime and I’m sooo ready for that. So today, I’ve decided to break my own rule about keeping foods somewhat in season because, honestly, who makes the rules around here anyway? I keep forgetting that little technicality. 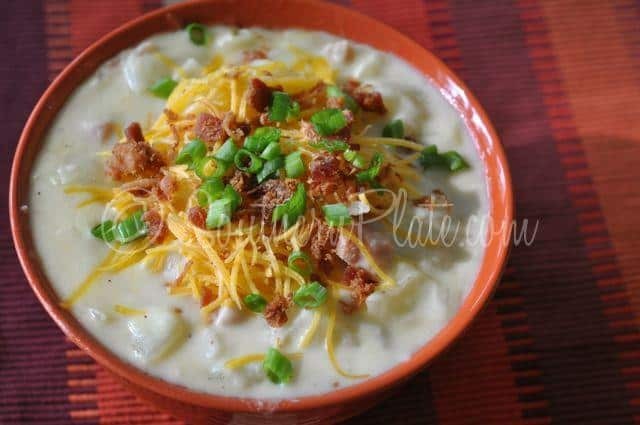 So turn down the a/c, put on a fuzzy sweater, grab a cup of coffee and come with me as we mentally fast forward to fall and make one of my very favorite versions of potato soup! 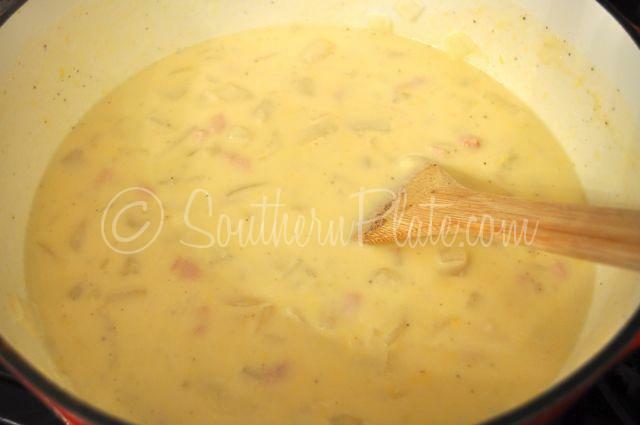 To make this soup you’ll need: 4-5 medium russet potatoes*, instant potato flakes, Heavy Cream*, 2 cans of Chicken Broth, a small yellow onion, cheddar cheese, salt, and pepper. Now we need to talk substitutions because there are a ton you can easily make when it comes to this soup. 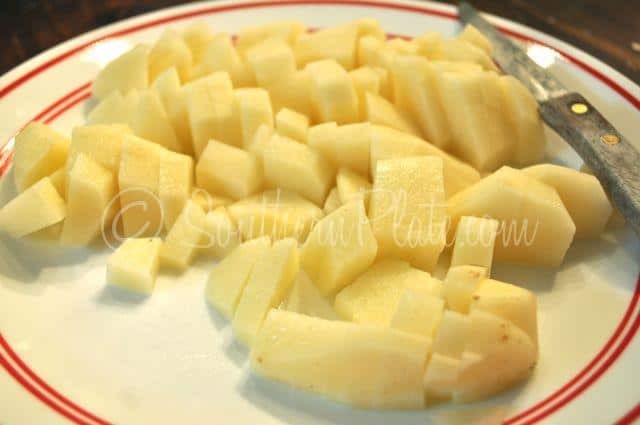 For the Potatoes – if you don’t want to peel and dice the potatoes, just grab a 32 ounce bag of frozen cubed hash browns. You know what, the shredded ones will work just fine, too! For the Whipping Cream – the cream gives this a rich and delicious flavor so it is my favorite to use. As a substitute though, I suggest canned evaporated milk, because it also has a very rich flavor that you just won’t find in regular milk. 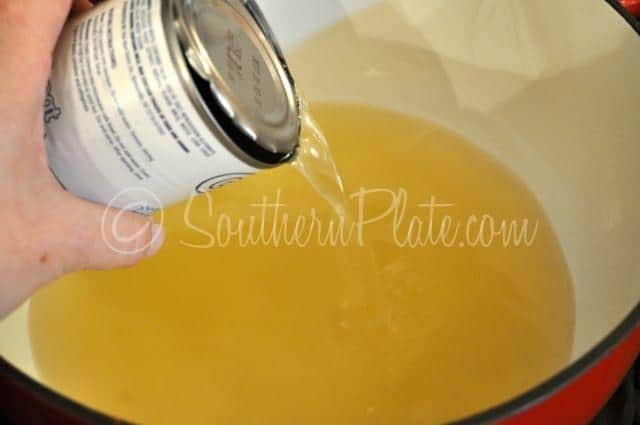 For the chicken broth – I usually don’t use chicken broth but I bought it special just for this tutorial – because I love you that much! Normally, I’d toss in a few chicken bouillon cubes with some water. The package usually says one cube per cup of water but I usually add an extra cube or two for more richness. I buy them in bulk at Sam’s and they save a lot of money over buying chicken broth. You can also use homemade broth, vegetable stock, whatever cranks your tractor. These ingredients create a great base for your soup but feel free to add the flavors that you enjoy as well. Garlic powder or a little minced garlic would be great. Some fresh or dried parsley would be a good addition, too. You might even want to add additional vegetables and just change it to a creamy veggie soup at this point. Today I’m making more of a pure potato soup but with a few key ingredients to really up the flavor. You’ll also need: Some smoked meat. 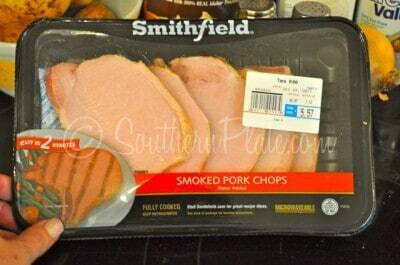 I’m using smoked pork chops. This is another thing I’m using to really add some body to my soup. Any type of smoked ham will do, though. I like these smoked pork chops because I use them in my freezer friendly twice baked potatoes and since I’m about to make some of those to freeze (they make such a quick side dish or easy lunch) I needed them anyway. Note: We no longer eat pork. I use smoked turkey instead of ham now. To begin with, pour your broth into your soup pot and put it over medium heat. Add all of that to your broth and season to taste with salt and pepper, but stay on the light side because we’ll season it again right before serving. I’d add about 1/4 of a teaspoon of salt now and maybe 1/8 of a teaspoon of pepper. 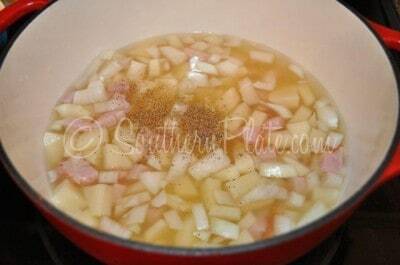 Bring that just to a boil and then reduce heat and simmer, covered, until potatoes are tender. This will take anywhere from ten to fifteen minutes, depending on how big your chunks of potato are. 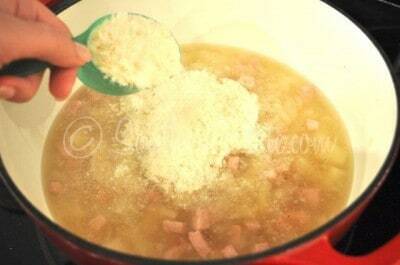 Now add in your instant potato flakes and stir that up. I love instant potato flakes as thickeners for soups and stews and making the crust to my Mama’s Taco Casserole. I don’t use them other than that, though. My Grandmother’s mashed potatoes were just too good. Now add in your cheese and pour in your heavy cream. Stir that up and cook for just a few minutes until heated through. I sometimes get questions from folks asking me how many servings a recipe has and I usually respond with a smile that “It depends on how hungry you are!”. In general, I feed a family of four and if I have leftovers I freeze them or use them for lunches throughout the week. If you are new to cooking for a family, in time you’ll get used to how much food certain things will make, for example, a 9×13 casserole. 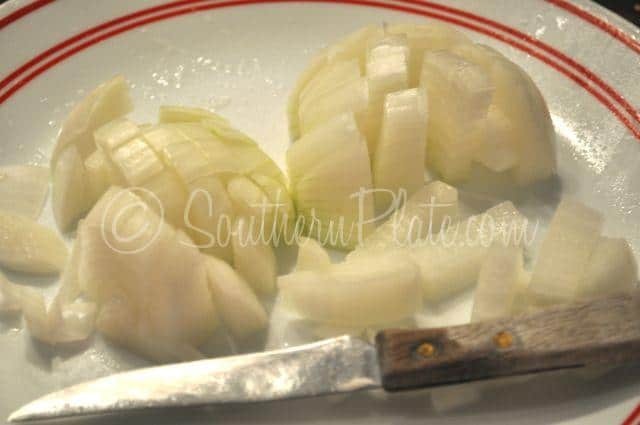 In my cookbook there are servings listed for most of the recipes but on SouthernPlate.com I just cook like my mother did and make sure I have enough for everyone, making good use of leftovers if any exist. However, I figure this makes four generous servings. That is all relative, though. Your version of generous may be different from mine, you may be hungrier than you realize or not as hungry as you thought you were, so the relative state of servings sizes has about as much value as one of those cardboard sleeves they slip onto coffee cups. Goodness, reckon how much they spend on those things each year? As always, serve to someone you love. Pour broth in dutch oven or soup pot and put over medium heat. 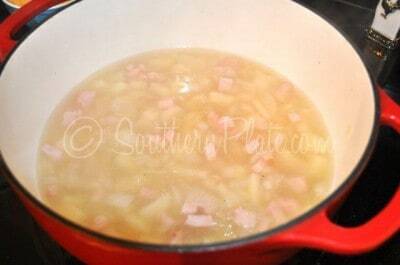 Add to broth along with ham. Season to taste (about 1/4 tsp salt and 1/8 tsp pepper). Taste and add more salt and pepper if desired. Serve immediately and top with your favorite toppings. Excellent advice from a teacher! There is almost nothing as good as a nice hot bowl of potatoes soup on a cold day! We always top it with Crispy Bacon (not bacon bits) and some extra cheese! Opps i never said i could spell…. Fall can’t seem to get here quick enough for some reason. I’ve already made several fall flower arrangements, and a wreath for our door. I just have to wait until it gets here to put them out. I’m ready for sweaters and cool air. This soup looks yummy. Potato soup is probably my favorite, especially when it gets cooler outside ( I tend to get too glistened if I eat it when it’s warm out, hehe). Sounds like a good idea for supper! Maybe with homemade rolls. yum! OHHH!!! If you’re on our FB page (and I think you are) I’d love to see photos of your flower arrangements!! Cool night in Mi last night, so making beef barley and mushroom soup today 🙂 Thanks for the potato soup recipe!! I love this recipe! 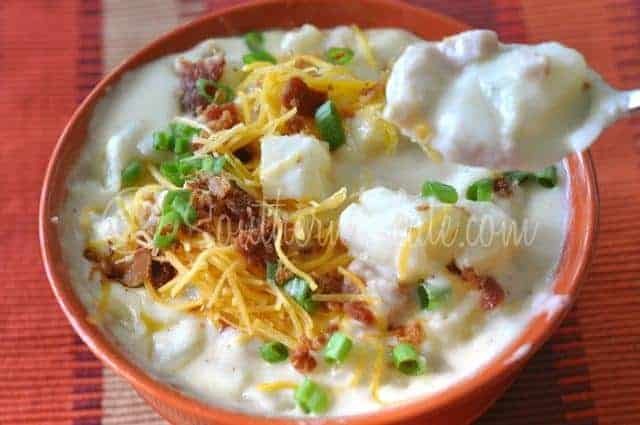 I love potatoe soup, can’t wait to make this, but I usually don’t start making soups until it gets cool enough to turn off the AC. I love making a stew that just simmers on the stove for a couple of hours. It warms the house and smells so delish! Also, I add an 8oz container of French Onion Dip to it and it gives it an extra flavor. I’m always told That everyone loves my soup. Give it a try! Love red potatoes and love french onion dip! God bless ya’ll, and hope you have a great day. Bless you too, Rose! You always make the day better for anyone who encounters you! awww…thank you 🙂 and the same goes for you, too. I don’t know what we would do without our Christy. We love ya!! I know the feeling Rose I am in South Texas and it is so HOT and dry—–can’t wait to make this soup, when it cools down some..
Oh Vickie, it’s horrible, isn’t it. Seems like Texas is going to burn up. Rose, if you don’t mind, where in East Texas. I live in Tennessee now but was born in Atlanta, Texas and raised in Southwest Arkansas area. I have family there and they said it has been HOT there all summer. We’re in the 22nd day of three digit temps here in the Houston area. Don’t mention hot soup around here! I live south of Atlanta, in a little town named Kennard. It’s close to Lufkin and Nacogdoches. It has been terribly hot and dry. We are all praying for rain. I live near HOTlanta and I’ve been wanting to make a big pot of chili for a week now. 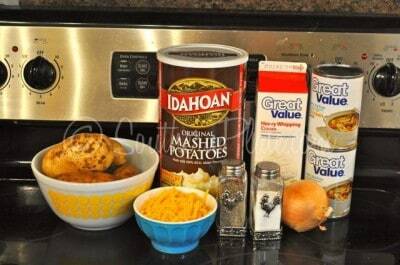 I may just make potato cheese soup instead! I think I’m just ready for the crispness of Autumn to “fall” on us. I can’t wait to fill our home with the scents of canning applebutter and applesauce. Come on October! Amen! My husband’s family is just outside of Hotlanta, we hope to get to visit them soon, but don’t expect a heat reprieve when we do! lol I’m with you, lets cheer for October! Me, too! We’re in the teaming metropolis of Douglasville! Sounds wonderful. Can’t wait to make it. How well will this freeze. There are just two of us and I love to have frozen soups for a quick supper when I don’t want to cook. Please post soup recipes every day until it finally conjures up fall weather. I have threatened to go ahead and decorate for Halloween. 🙂 I have a really good potato soup recipe that calls for the shredded hash browns. Really easy. I LOVE potato soup! Too bad I don’t have any potatoes in the house or I would make this! And I pulled out the jeans and a light sweatshirt already. It’s a whole 65 degrees here in PA today and the wind is a little chilly. Bring on Fall!! 65 degrees??? I’ll be right over Hope! I love potatoe soup, yours looks yummy. I usually make mine in the crockpot and my mom has told me it is very close to my grandma’s. Im like you I usually used chicken boullon cubes. Instead of ham I use bacon. I was just thinking yesterday about all the apple recipes I want to make. Fall is my favorite season! Love my crock pot and LOVE Apple recipes! I’m photographing one up today! Thanks, Christy – I can WAIT to try to potato soup recipe! Since I live in central AL and it’s still boiling hot, I’ll keep my fingers crossed for a cooler night so I can try it! Yummy!!! Oh, and I’m looking forward to all the things you are this fall – cooler weather, pumpkins, long sleeves, etc. My boyfriend and I are headed to KY twice in September, so I’m hoping it’ll be a little cooler there ; ). I am in Kentucky you can expect mid to high 80’s and 60’s at night in September, unless we get a cold front to move in and get the temps down lower. Where are you heading in KY, I live in Eastern KY, and we are in the upper 80’s this week, hoping for cooler weather myself. I am not sure Vette, life is a little crazy here at the moment but I hope to get back up that way soon. At the store yesterday i bought the stuff to make a big old pot of chili. So what if is 86 degree outside, chili just sounds so good and it has been so long since the winter months. I can’t wait till sweater season and all leaves on the trees changing, though if we don’t get some rain soon all the leaves will just be brown again this fall. Wearing my pretty sweater I just ordered this morning! I just couldn’t resist after seeing all those cozy-looking ads like you were talking about! Also, I can’t wait to make chili. I just can’t do it in the summer – I think it’s a mental block of some sort! I’ve always read that you don’t freeze soups that contain dairy… I’d take the recipe as far as you can without adding the cream if you want to freeze it. Christy, what are your thoughts on this? Yum, I love Apple Crisp! I love to make homemade soup. My very favorite is Italian Wedding Soup. 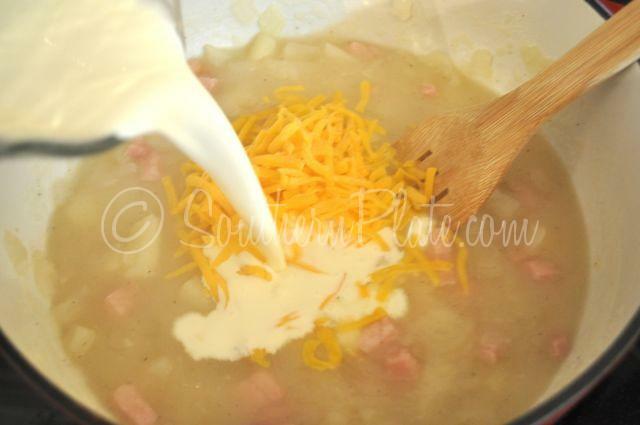 I have never made Potatoe Soup, but as soon as it cools off here in Florida, I plan to have it bubbling on my stove. There are some older men in my church who live alone; and a gift of soup is always welcome. I Look forward to reading your blog everyday. What a sweet thing to do Sue! I know they appreciate you sharing! How exciting Michelle! I know you are ready to see him! oh yay! had me some potato soup this past week that my sister made. it was awesome! i live in same area as Christy – and it is soooo hot. It won’t be cool around here until November – if we are lucky. Those first few football games are roasting HOT! War Eagle! Can’t wait to try this – I have several potato soup recipes – but I have never actually tried any with whipping cream. Actually I am 41 and have NEVER even bought any. Yum. Let me know what you think Kim, I hope you like it!! Wow, Potato Soup had me @ “Hello” but to read this post re: variables, such as smoked ham OR smoked pork, frozen hash browns OR dicing whole potatoes, I love the improvising that is part of this recipe. That is so my style since I live out in the country now and grocery stores runs take a little more planning. Delicious comfort food and sooo very Fall-like. 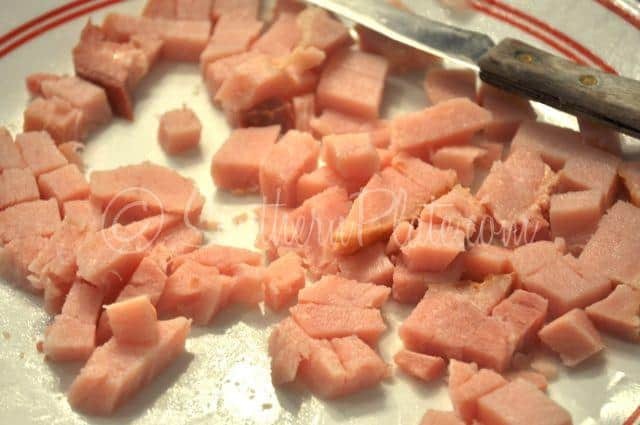 I will be trying yet another winner of a recipe from my fav Southern Plate, the first day it is under 97 degrees…..at least by 10 degrees. ;-D Thank you, as always, for your time and efforts to keep the whole world fed…..annnnd happy. Hugs to you, Christy girl. T.
~HUGS~ to you Terri, hope it cools down your way soon! I hope it gets here soon too! I am so glad you are enjoying the site Beverly and ~HUGS~ to you! drives the neighbours nuts to smell it simmering. This time last week I was walking on a glacier at the Columbia Ice Fields in Alberta, Canada. I would have done anything for a nice warm bowl of potato soup but instead had to settle for a coffee. I love the Fall – colors, smells, sounds of leaves crunching under foot as we go for a walk in the woods, fresh cut hay… I picked 2 gallons of berries (chokecherries) yesterday so will now be making fruit syrup and jelly. This is the first of the fall canning/preserving process and will be doing it for many weeks to come. Then once Fall really gets here it will be time to preserve all the stuff from the garden that hasn’t been devoured up til now. This year we have an over-abundance of tomatoes, cucumbers, beets, turnips and zucchini. It will be way too much for me to preserve so I think the local food bank and senior citizen centres will be getting a large delivery. Lunch time – soup time – home made chicken vegetable and cheese biscuits. Oh wow, walking on a glacier, what an adventure! Oh wow – fall is just one month away – the autumn equinox falls on September 23 girls, so keep your sweaters hanging by the back door, it will be here before you know it. Talking about the potatoe soup has got me hungry for our favorite soup – Chicken and Rice. We love having that when the weather turns cool. I’ve already made one of our favorite winter time dishes, so I guess I really just skipped over fall completely when I made Sausage Casserole last week. We are still enjoying our okra and tomatoes from the garden – though they are winding down. I know this summer has been a roaster, but it has really zoomed by – just like all the other seasons do when you are 60 years old. Oh well, I’m just that much closer to Heaven, so nothing to complain about there! Oh wow, thanks for letting us know the date Nanee!! I hope we get several weeks of fall instead of just a few days as well. I’m with you, Christy. Can’t wait for fall! I love those first few weeks (or days, sometimes that’s all we have!) when the air seems cleaner & crisper. Everything just feels brand new in the fall, sky is bluer, colors are deeper. There’s nothing specific…all of it together just lifts my spirits! I’m a soup person so I hope you’ll keep cranking out those soup recipes…any good recipes for old-fashioned chicken soup? I love the classics! Thanks for the potato soup recipe! I am working on several recipes for some great fall foods. Keep a look out. Oh Kim!!! Firstly – War Eagle!!!!! LOL I’m in central Bama and am dying for a fire in the fireplace with the ballgame blaring through the house and some cooler weather!!! Let’s be done with the heat already!!! Get to the store and buy that fabulous cream!!!! Makes a potato soup (and grits, for that matter!) sooo yummy!!!!!! I’ve personally been craving chili and potato soup! This is a little different than my normal Paula Deen recipe here with the yummo shrimp ( http://www.foodnetwork.com/recipes/paula-deen/potato-soup-with-shrimp-recipe/index.html) so I think I’m gonna have to come up with some combination, because hubby (the Bama fan – lol) will never let me leave out the shrimp! 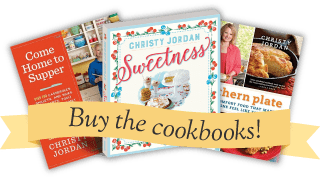 Thanks Christy for this fabulous recipe and I’m off to do a cool weather dance or something – lol! LOL, I hope you enjoy the soup Nette! I hope you enjoy it Bev!! I’m from Christys’ area too, I’m so looking forward to cool days and even cooler nights, being able to sit on the front porch and enjoy sitting there , decorating the house for fall and putting mums in the yard, in all thier beautiful colors, I love theFall and Spring my favorite seasons, Love watching the trees changing into thier fall colors , Love it when the trees are Bright blazing colors, although they mat not put on a show for us this year. I will wait untill it tuns cool to make the potatoe soup, it is different than the one I make , but sounds very good. Come on in Fall, I’m hoping we get a fall not just a few days then winter. You could be my twin. All the things you listed are my favortie things about fall(except the leaves, we dont get that in Texas) I love to decorate for fall and Halloween, Thanksgiving. Love some potato soup. Wish it would cool off here 100+, ouch. I hope so too Shelia, it seems like the last few years it has gone straight from summer to winter. Does anyone know if this recipe can be prepared in a slow cooker? (or pressure cooker, for that matter) Thanks. I do it in my pressure cookers all the time. Saute the onions in a little butter, add the broth and the potatoes, cover the cooker and bring up to pressure for 6 minutes and let it come down from pressure on its own. Open the lid and bring back up to a simmer, add the cream and salt and pepper, maybe a bit of roasted garlic, let simmer for about 10 minutes to thicken up a bit. If you like you can mash some of the potatoes to thicken it up more or add a bit of instant potatoes to it. I top each bowl with a spoon of sour cream, bacon, shredded cheese and chives. It warms you up on a cold day and can even be served chilled on a hot day. This soup goes great with a loaf of crusty bread to dip in. I can’t wait for cold weather to get here !!!!!! Me too Tina, me too!